Jackpotjoy is probably one of the most well-known online bingo websites around. The site has won many industry awards and now has Paddy McGuiness at the helm of all their advertising. As a new member, you can claim up to £50 of Free Online Bingo plus 30 free spins on the Double Bubble slot when you deposit and spend £10 as a new player. To open a new account you will first need to click on one of the links within this article or one of the buttons at the top or bottom of the page. This will take you through to the Jackpotjoy website. Then select the BIG ‘JOIN NOW’ button to be taken to the registration form which you will need to complete in full. You can then make your first deposit so you can claim your Free Bingo tickets and 30 Free Spins. You need to make a minimum deposit of £10 and play the £10 to receive your welcome bonus package. You will then receive 200 free bingo tickets that can be used to purchase play in bingo games where tickets would range from a value of 1p up to 25p each. This gives you a value of up to £50 in free bingo. The 30 free spins are available to be used on the Double Bubble online slot which is one of Jackpotjoy’s most popular slot games.This is a great fun way to start enjoying your play at this popular online bingo website. Once you are a member at Jackpotjoy you can start playing their bingo games, online slots and more. It is worth checking out their promotions page as well as they have many regular and special one-off promotions that can earn you such as extra free spins, bonus cash or major prizes such as holidays. With their big selection of different themed bingo game rooms and variations of 90 ball, 80 ball and 75 ball bingo and their Snap game, you will certainly not get bored. The Gamesys powered site also has a vast selection of online slots, many unique to the Gamesys group and new games are added frequently. 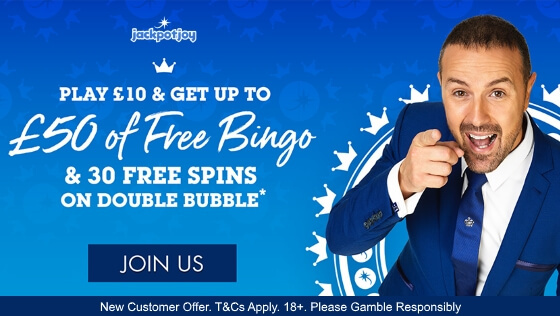 So why not give Jackpotjoy a try for a really great online bingo experience and claim your Free Bingo Bonus up to £50 and 30 free spins after you play your first £10. For full details of the terms and conditions of this offer, please visit the Jackpotjoy website.